Thursday saw the traditional topping out ceremony at Continental Arena’s construction site, one of the biggest projects in eastern Bavaria currently. The ceremony marked the very last primary roof beam being installed atop the stands. The symbolic pinnacle was pulled up by mayor Joachim Wolbergs. The stadium construction enters its final stage now with just over half a year to go. All of the concrete prefabs are in place. The steel structure still requires some work, but already now installation of the red tinware cladding is underway. 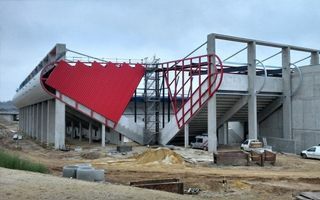 It seems that early into the 2015/16 season Jahn Regensburg will enjoy the opening of Continental Arena, a €53 million new home for 15,000 people. While the prospect may seem exciting, club representatives weren’t too happy at yesterday’s ceremony. The reason is simple: Jahn, who were playing in 2. Bundesliga back in 2013, are now rock bottom of the 3. Liga with poor chances of a comeback in the second half of this season. This may mean opening will take place in fourth league surroundings. And that caused questions from the press, who will make proper use of the stadium if strongest local team gets relegated below central level football. Mayor Joachim Wolbergs stayed calm and confirmed Jahn will remain the anchor tenant, while other events may improve the calendar on some occasions.